Solid, sleek and durable aluminium houses our 7SENSES tracking technology. Experience unrivalled feel, speed and pinpoint accuracy from one good-looking ergonomic mouse. 7SENSES, new tracking technology inside the rollerbar, provides unmatched cursor precision and control. The sensors, placed inside the bar, protect it from dust and dirt. 7SENSES tracks cursor position, constantly adjusting speed and acceleration to ensure the rollerbar is as central as possible, while intuitively adapting to your pace to decrease micro movements and increase efficiency. Get more control and less strain with the bigger and better rollerbar. We’ve replaced the mechanical mouse click with a virtual click to remove force feedback and reduce the risk of unnecessary strain. The effortless click mechanism combined with the thicker, textured rollerbar allows you to work with maximum precision and comfort. The new rollerbar is easier to use and even more precise. 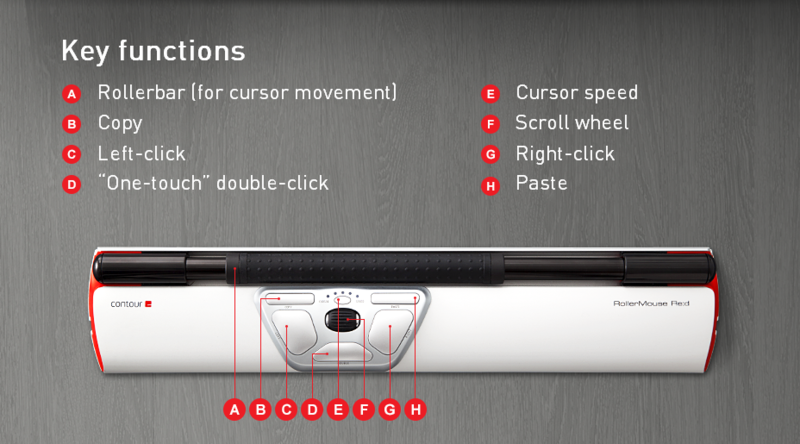 The larger surface gives you more control when pointing, rolling or clicking. It adapts to the individual, from professionals using CAD and other advanced design programs to the average user. 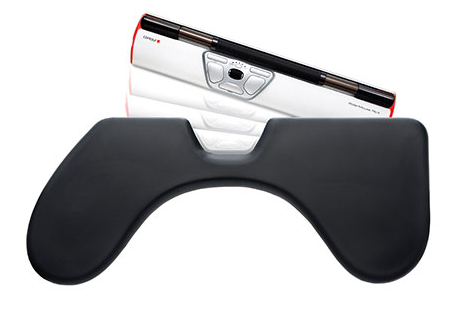 RollerMouse Red is compatible with Apple OSX, Apple Mac OS 8.1 or newer, Microsoft Windows 7/Vista/XP/ME/98 and comes with a 2-year warranty. 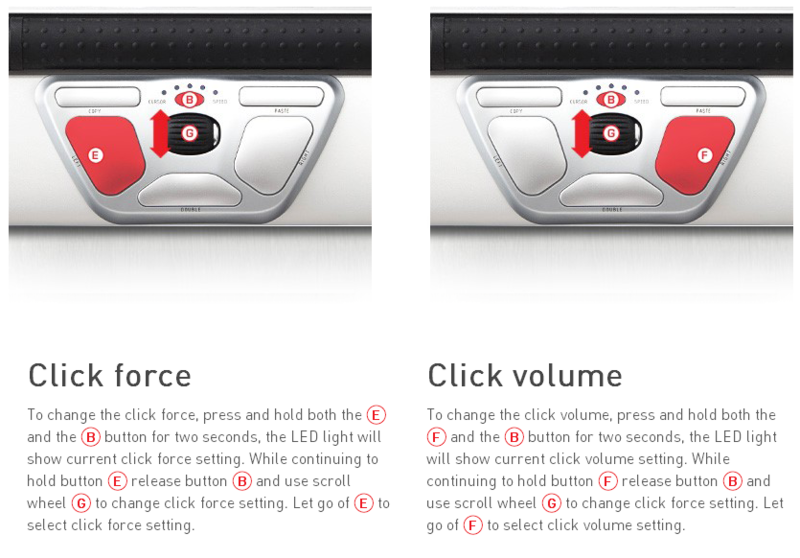 Make it your own: Customize click force, sound and the way you work. Since there are no reviews here, I decided to submit this to help people decide if this product is worth splurging on. In my case, the pain of mousing drove me to seek better alternatives (ulnar nerve compression!) I looked into the other brands of ergonomic mice and wasn't convinced any of them would really relieve that pain. Since I was also looking to free up room on my desk, I was not keen on the large footprint of some of these mice. I also didn't want to mouse with my other hand as some recommended. I bought this product here almost a year ago anyway and I'm absolutely thrilled I did!!! (I chose it over the other RollerMouse models due to the improved rollerbar.) No more reaching hundreds of times a day between the keyboard and distant mouse as I work in the database. No more PAIN dragging my inflamed ulnar nerve around the table, no more mouse arm pain, no more shoulder and back pain!! Now I work quickly and comfortably in my comfort zone. I'm definitely sticking with my RollerMouse Red and I recommend you buy it too if you have similar afflictions or you're just tired of reaching for that mouse all day long!